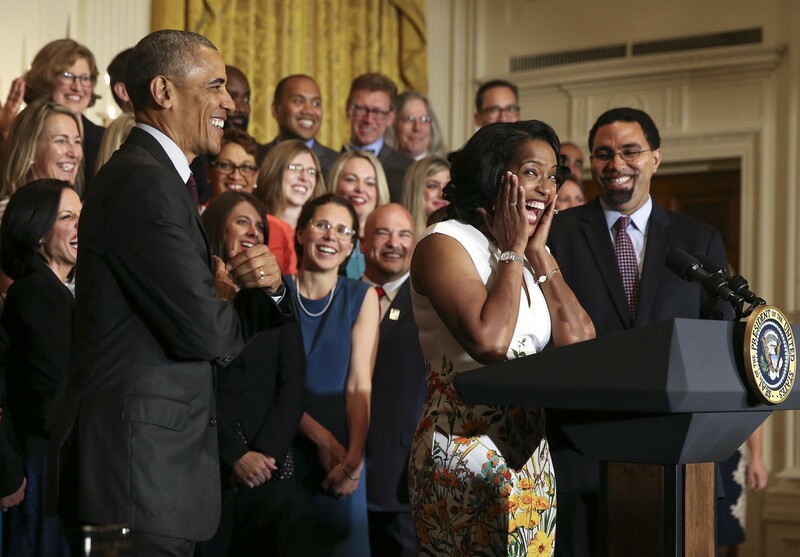 Jahana Hayes reacts during a ceremony where she was named 2016 National Teacher of the Year by President Barack Obama in the East Room of the White House in Washington, May, 3, 2016. The Connecticut educator who won a primary for congress last month produced a video for less than $20,000 that brought in $300,000 in donations after going viral. These are not the stories that candidates usually turn to the camera and open up about in ads. One talked about her father’s violent temper and how she once watched him throw her mother through a plate glass door. Another recalled watching his brothers struggle to find steady work because of their criminal records. The wave of female, minority and outsider candidates that is breaking cultural barriers and toppling incumbents in the Democratic Party is also sweeping aside a long-standing norm in campaigns: That the public image of politicians — especially women — should be upbeat, uncontroversial and utterly conventional. For many of these Democrats who were running against better-financed rivals, the breakthrough moment came after they got personal in relatively low-cost videos that went viral, reaching millions of people. Using documentary-style storytelling, candidates have found a successful alternative to the traditional model of raising huge sums of money that get spent on expensive, 30-second television commercials. The videos are chiefly intended as ads, but they also served a fundraising purposes. For a fraction of the cost of those ad buys, these videos can be a force multiplier for candidates, helping to spread their stories in a way that is easily shareable and can inspire donations. 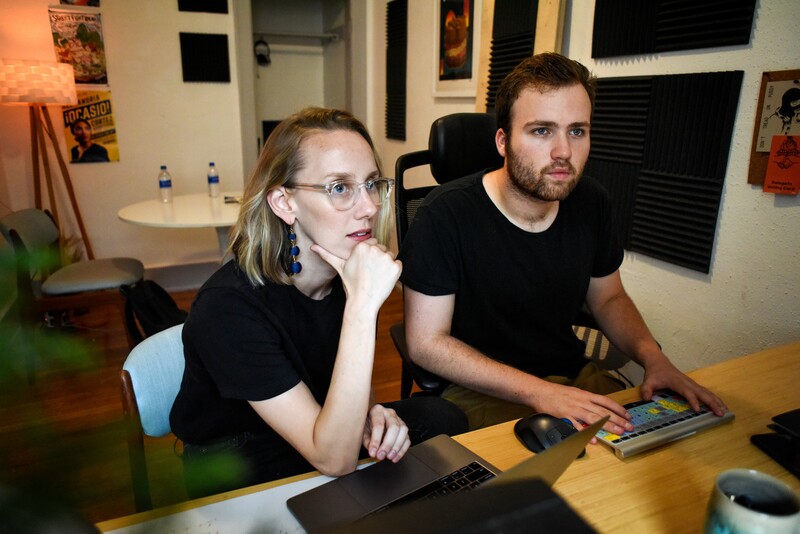 Naomi Burton and Nick Hayes, the duo behind Means of Production, work from their office in Detroit, Mich., Aug.16, 2018. The company creates narrative-based political ads, most notably for Alexandria Ocasio-Cortez. Jahana Hayes, a Connecticut educator and first-time candidate who won a primary for Congress last month, produced a video for less than $20,000 that brought in $300,000 in donations after going viral. In it, she described the difficult circumstances of her upbringing — being raised by her grandmother while her mother battled addiction and then, at 17, getting pregnant. Republican candidates this year have been using their own personal, sometimes primal, approach — though with far different messages and audiences in mind. They have also largely stuck to the 30-second commercial format rather than the narrative videos, however. Strategists say that messages of empowerment are especially potent today because many voters on the left are eager to see more women, minorities, young people and outsiders in government positions. “People are broadening their definitions of what political leaders can look like,” said Teddy Goff, a co-founder of the agency Precision Strategies, a Democratic consulting firm, and President Barack Obama’s former digital director.